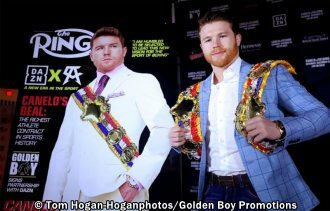 LOS ANGELES (Oct. 18, 2018): Canelo Alvarez (50-1-2, 34 KOs) received the Ring Magazine Middleweight World Title and the Pound-For-Pound Championship Belt at the Intercontinental Hotel in Los Angeles. Canelo, who also holds the WBC, WBA, and Lineal Middleweight World Titles, will move up to 168 pounds to challenge Rocky Fielding (27-1, 15 KOs) for his WBA Super Middleweight World Title in a 12-round main event on Saturday, Dec. 15 at Madison Square Garden and streamed live on DAZN. "I want to thank God, my team and my family. I want to thank Golden Boy as well. Having a belt like this is a responsibility, and this is a responsibility that I plan to undertake. I never imagined that my success would reach this magnitude. This just shows that with discipline, hard work and love for the sport, one can achieve anything. A lot has changed in one year. It's been a big change. I'm going to defend this title with honor. See you all on December 15." "The Ring Magazine World Title is the most prestigious title in boxing. In order to earn it, the top two fighters in the division have to fight. The pound-four-pound belt has been held by great fighters. Bernard Hopkins had it. Pernell Whitaker had it. I had it, and now Canelo Alvarez has it. We are very proud of his accomplishments." "The lineage of the Ring Magazine Championship belt goes back to Jack Dempsey. The greatest fighters of every era held the Ring Magazine Title. The pound-for-pound title was created in 1993, and it was presented to Pernell Whitaker after his controversial draw against Julio Cesar Chavez, Sr. This is brilliant company that Canelo joins. The belt was with Whitaker, Oscar De La Hoya, Roy Jones, Jr. and Bernard Hopkins." https://www.facebook.com/DAZNUSA/. Follow on Instagram @GoldenBoyBoxing, @Canelo, @Rocky_Fielding, @MatchroomBoxing and @DAZN_USA. Follow the conversation using #CaneloFielding.